I've gone on several ride-alongs with John, a member of our Incident Response Team (IRT), to show the fantastic work their group does to keep our highways safe. I always marvel at the way he maneuvers through traffic, exiting his vehicle as traffic zips closely by to help a stranded motorist, clear some debris or assist at a crash. During those ride-alongs, John and I talk a lot and it usually comes back to our families. He's incredibly proud of his kids and his grandkids – his face lights up when he's talking about them, and I know how much they all depend on each other. So my heart sank Tuesday when I learned that John was involved in a serious crash that blocked much of westbound I-90 across Lake Washington around 10:30 a.m. We never like anyone to be hurt on the roads, but when it's a friend the feeling is magnified. 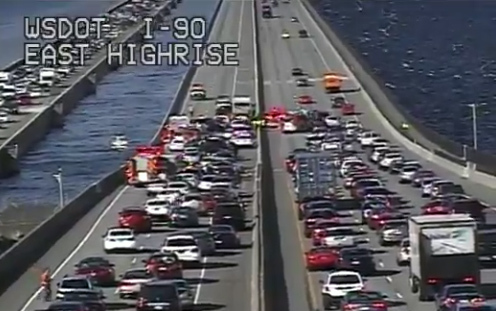 It was a huge relief when I heard that John was OK.
blocked much of westbound I-90 across Lake Washington. The incident was scary, but unfortunately it's one we see all too often. John did everything right – he set up his truck and activated his traffic arrow sign and emergency lights before leaving his vehicle to assist a disabled tour bus on the right shoulder. The State Patrol said that's when a van traveling at high speed ran into John's truck. 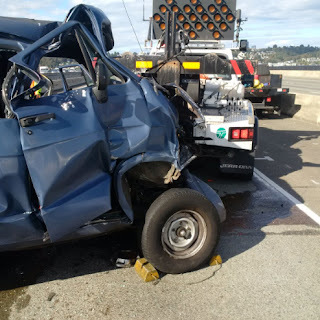 Fortunately, John was far enough away to escape injury, but the driver of the other vehicle – who wasn't wearing a seatbelt – was seriously hurt and the express lanes were blocked for 1½ hours. (picture from Washington State Patrol). The driver of the van was later arrested for DUI. John got lucky, but it isn't always the case. Last year a worker was seriously hurt near Aberdeen, and we regularly see work-zone collisions or close calls. In most cases, 97 percent in fact, it's someone in the non-DOT vehicle who is injured, so while we want our workers safe, it's in your best interest to be safe near work zones too. Pay attention to signs warning of lane closures. Slow down and give workers space. Focus on the road; everything else can wait. And of course always stay sober behind the wheel. John and the rest of our IRT group don't look at what they do as anything special. They know it's dangerous, but to them, it's just their job. They take great pride in helping people and keeping you, your friends and your family safe. Please do your part and help keep John and his teammates safe so they can go home to their families. It’s been one year since we launched the I-405 express toll lanes between Bellevue and Lynnwood. It’s been a year of launching, learning, and listening. Here’s a recap of the #405ETL one year milestones. Provide a faster and more predictable trip. The old HOV lanes could not keep up with our region’s booming traffic growth and were often as congested as the regular lanes during peak periods. Today, carpools, vanpools, transit and toll-paying customers have a more predictable trip and save on average between 10 and 15 minutes in the express toll lanes compared to the regular lanes during peak periods. There is increasingly more demand from drivers than there is capacity in this section, which means higher toll rates for longer periods of time. When toll rates are at $10, speeds will often drop if drivers continue to enter the lane, but the express toll lanes are still usually faster than the regular lanes. 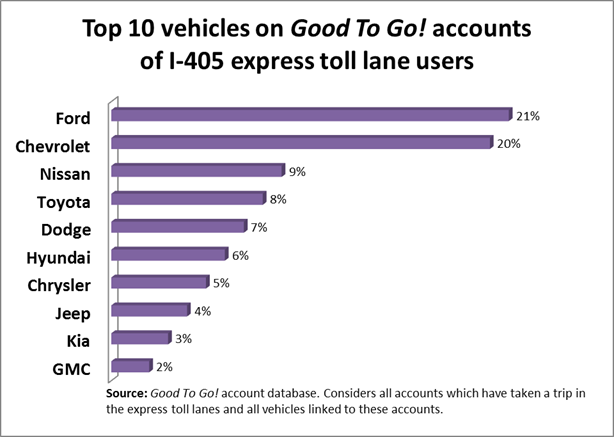 Most drivers don’t use express toll lanes every day, but they are an option when you need them. About 70 percent of Good To Go! pass holders who use the express toll lanes use them between one and five times a month – or about once a week. Not only are express toll lanes covering operating costs, WSDOT is already reinvesting $10 million of toll revenue back into the corridor to improve traffic in the Bothell area. The Northbound Peak Use Shoulder Lane Project between SR 527 and I-5—planned to open next summer. Feedback plays an important role in our work, and we want to continue to hear about your experiences in the express toll lanes. Since opening, we have listened and acted upon driver feedback, and made more than a dozen improvements to the express toll lanes including longer access points, additional signage and pavement markings, algorithm changes to respond to traffic volumes and patterns, and opening the lanes to all during nights and weekends. The 2015 Connecting Washington package along with toll revenue from I-405 express toll lanes funded the Renton to Bellevue Widening and Express Toll Lanes project. Travelers on the stretch of I-405 between SR 167 in Renton and NE 6th Street in downtown Bellevue face one of the most gridlocked routes in the state, particularly during peak travel times. 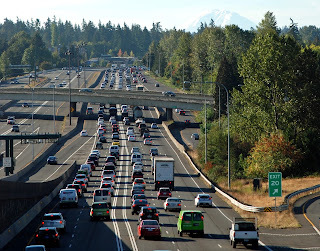 This project will add new capacity through a two-lane express toll lane system that connects the SR 167 HOT lanes in Renton to the current system in downtown Bellevue. 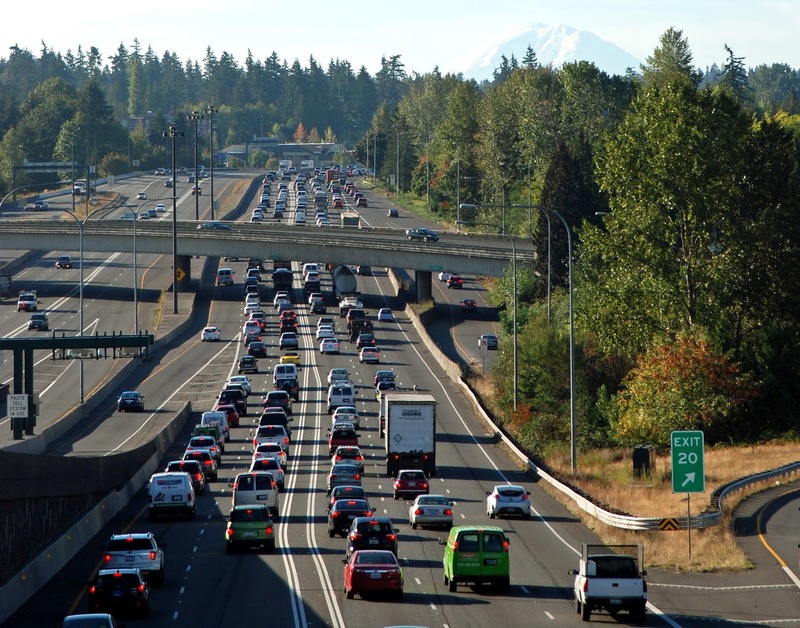 For the longer term, WSDOT will continue to partner with local cities and transit agencies to implement the I-405 Master Plan, a multi-modal and balanced approach to managing congestion. This work includes looking at additional capacity projects north of SR 522, such as a phased approach to extending the express toll lanes. Working in transportation, I never thought I would learn so much about trees. 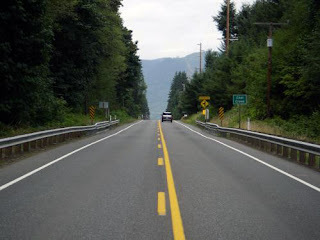 It turns out that knowing the various types of trees along our highways can be vital – especially for windstorms and our latest botanical bind… root disease. 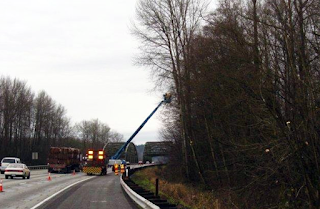 A few months ago, our landscaping crew investigated reports of a downed tree along State Route 522 at State Route 202 in Woodinville and discovered something even more concerning. It appeared that several of the evergreen trees in the northeast corner of that interchange were suffering from laminated root rot, or damaging root disease. State Department of Natural Resources experts confirmed our diagnosis and advised us on how we should handle the problem. Laminated root rot is caused by a fungal pathogen and is one of the most damaging root diseases among conifers in this part of the country. 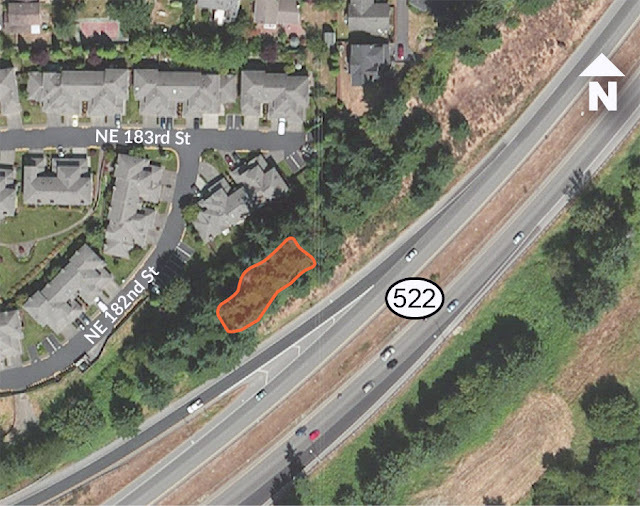 The area where diseased trees will need to be removed in Woodinville. We decided that the rotted trees needed to be removed before a fall windstorm knocked them down and endangered the public. At least six of them have already fallen over. To prevent the infection from spreading further, a 50-foot radius of trees must be cleared – a total of at least 57 trees. trees that threaten the highway. After each tree is removed, its stump and logs will be examined for any evidence of the disease. If we discover any new root rot, additional trees may need to be cleared in order to provide that 50-foot radius to keep healthy trees safe and protected. In order to safely remove the trees, our contractor crews will need to close the right shoulder of westbound SR 522 approaching and along the off-ramp to SR 202. They may also need to completely close that off-ramp up to three nights. Unfortunately, there is no short detour for overnight drivers on westbound SR 522 who need to get into Woodinville if the ramp is closed. 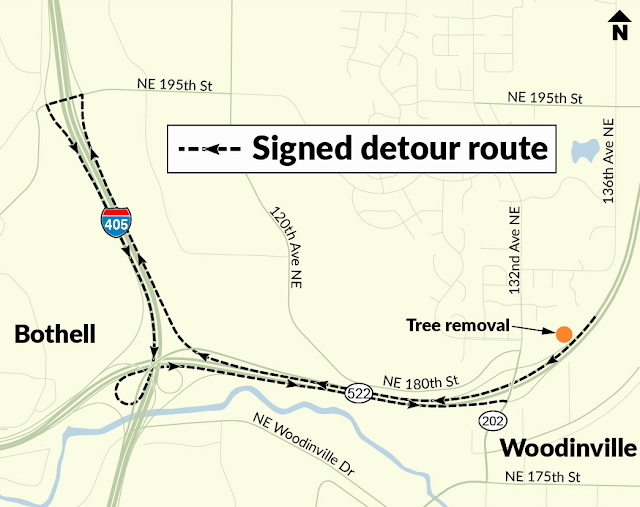 A signed detour will be set up along westbound SR 522 to northbound Interstate 405, off at Northeast 195th Street/Beardslee Boulevard in Bothell, then onto southbound I-405, eastbound SR 522 and off at SR 202. The detour during the SR 522 tree removal job won’t be a short one so be sure to add extra time to your trips. Work on the approximately $100,000 to $150,000 project is set to begin in early November. The tree removal process should take about three weeks. 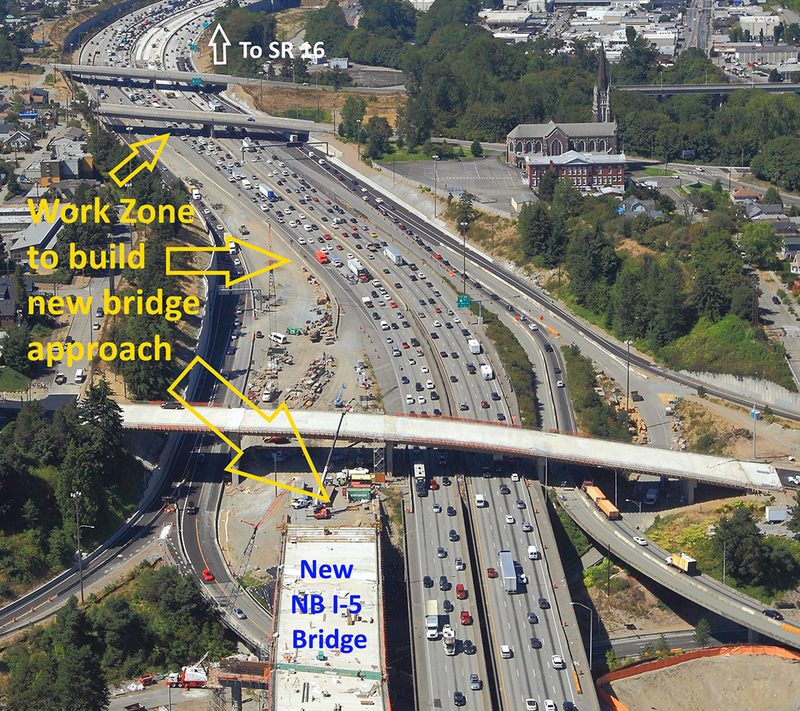 Ramp closure dates and times will be listed on our King County Construction page. After the trees are removed, we’ll seed and mulch the area. I’m far from a botanist, but I do know that will help new trees eventually grow back in. Usually in transportation we help save lives by making our roadways safe. This time we’re bringing new life as well and learning just a little more about the fascinating world of trees. From summer construction to winter maintenance, there's a number of reasons I-90 backs up and closes. Although we don't like it when I-90 gets mucked-up, we are excited to announce a new feature for those traveling on I-90 over Snoqualmie Pass. Starting next week, we'll be sending notifications for high impacts over the pass. Events such as major collisions, anything causing more than a 30-minute backup, pass closures, heavy snow forecast events and avalanche control work, just to name a few. As you already know, travel over the pass, especially during the winter months, can be unpredictable and we want to help you stay informed. Or just send a text to sign up! 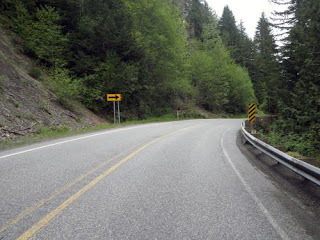 Send a text message to the number 468311 with the words "wsdot snoqualmie". To unsubscribe, send a text message to the same number with the words "wsdot stop". However, even though this information is available via text message, we ask that you never text and drive. #itcanwait Sign up and let us know what you think! Trying to accommodate 197,000 vehicles a day while building the most substantial overhaul of Interstate 5 in Tacoma since the highway was first opened in the 1960s is, to put it mildly, a challenge. We've asked for a lot of patience from drivers this summer. 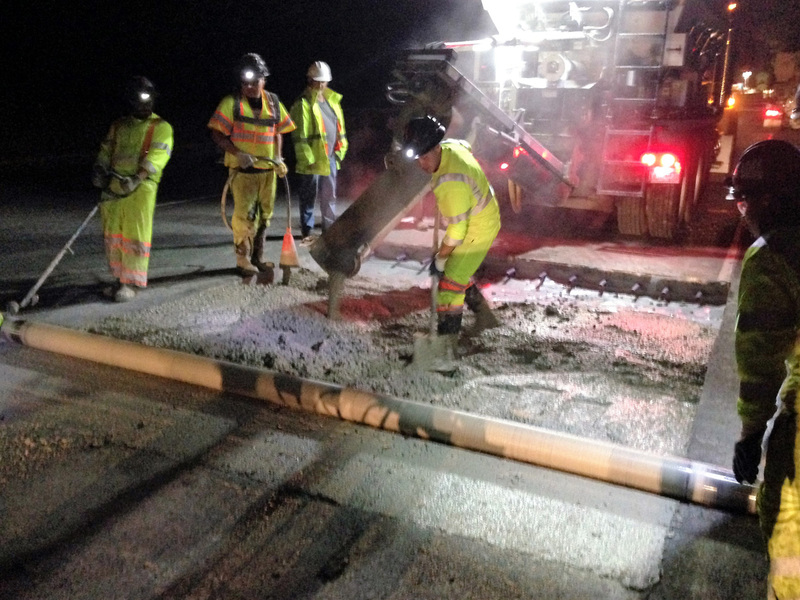 We've had overnight closures, full weekend lane closures, and many ramp closures and detours. Your cooperation during those temporary lane restrictions have helped construction move forward. We need your help once again as we move into a new phase of building HOV lanes through Tacoma on I-5. Over the past 1½ years, commuters have watched crews create a new northbound I-5 bridge that spans I-705 and State Route 7. Now we need to build the roadway that will lead to the new bridge. So far we've moved a lot of dirt, widened the freeway and installed new retention walls. Workers even rebuilt the Pacific Avenue overpass so there weren't bridge columns in the way of new lanes. The next step in this big project is to relocate the actual northbound I-5 highway. Drivers should start preparing now for a major lane restriction on SR 16 as we create a new path for I-5 in Tacoma. Anyone who has maneuvered through traffic between 38th Street and the Tacoma Dome knows that there isn't much room for contractors to work in. To begin relocating the path of northbound I-5 requires reducing eastbound SR 16 near I-5 to one lane. This temporary restriction is expected to start soon. Once enacted, it will continue around the clock through the spring of 2017. Commuters have experienced this particular lane reduction before, and it wasn't fun. We know there will be backups and delays, especially during the morning and afternoon peak commute hours. Again, we extend our thanks to drivers who've continued to be patient while we build HOV lanes through Tacoma. There is light at the end of the tunnel. Every day, together, we are one step closer to reaching that goal. Damaged tire on the vehicle of a suspect in a work zone collision. Can you imagine what it would feel like to be in the path of an out of control vehicle, barreling straight at you at freeway speeds? The horrific sound of metal on metal as the vehicle crashes just feet away? 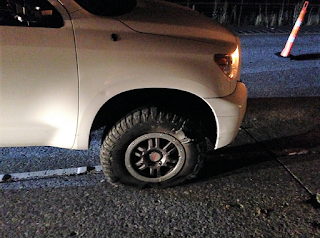 This actually played out at one of our work zones on Interstate 5 near Woodland shortly after midnight on Saturday, Aug. 6. Thankfully no one was hurt when an out-of-control vehicle crashed into a mobile barrier and not the crew replacing concrete panels on the highway. The driver was arrested and charged with 32 counts of reckless endangerment, one charge for each person working on the highway that night, and DUI. Construction workers on I-5 working behind a mobile barrier. Unfortunately, work-zone collisions are not uncommon and always present a challenge for keeping our crews safe. But we're hoping a new tool will help. A mobile barrier is a new tool we're testing to create a safer separation between traffic and our work zones. Each unit is a big steel wall connected to a truck trailer that can be parked or pulled along the highway while road work is being done. I don't know about you, but I'd rather work behind a metal wall than a plastic cone when up against traffic going 60 mph. 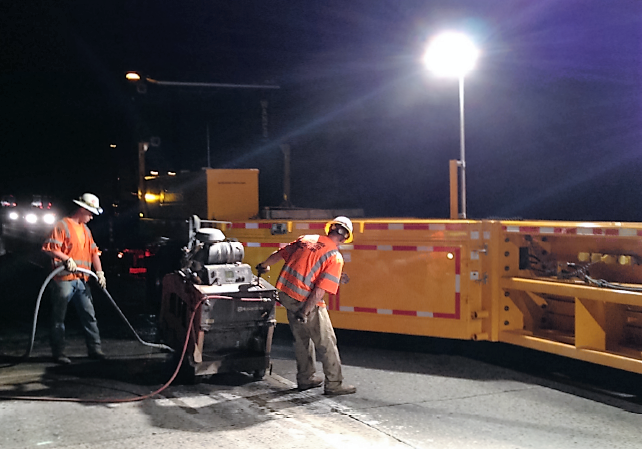 A mobile barrier helps keep our workers safely separated from traffic. I mean, look at the crew in the photo above, they are kneeling on the roadway, less than 20 feet from interstate traffic! 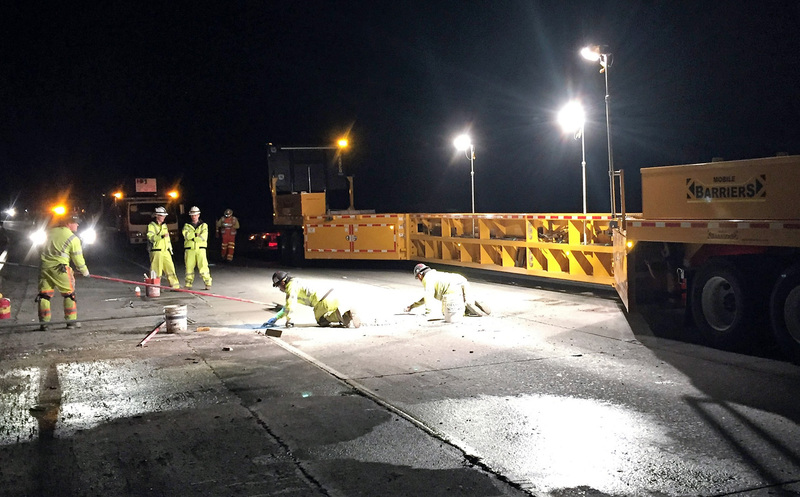 While mobile barriers are designed to create a safer work zone, they have an added benefit of reducing the amount of time workers are on the highway, and the time traffic is delayed by construction. work, and keeping them safe is our top priority. Mobile barriers have many benefits, but they also have some limitations. They are expensive. The cost of metal is much higher than the cost of traffic cones. The barriers are large, like a semi-truck, which can be a challenge when working on the highway. Maneuvering them around live traffic and small work areas means they're not always the right tool for the job. When you think about it, each one of those workers has a family who expects them to come home at the end of the shift - you can't put a price on that. It seems the money spent for the mobile barrier was worth every penny. While it may not make sense for every roadway project, we're now looking at ways to use mobile barriers on more of our construction and maintenance jobs around the state. What school bus is green and white and floats on water? Friday, Oct. 28: A big thanks to all the young artists who submitted drawings to our contest! With more than 150 submissions, it was tough to choose just one winner! 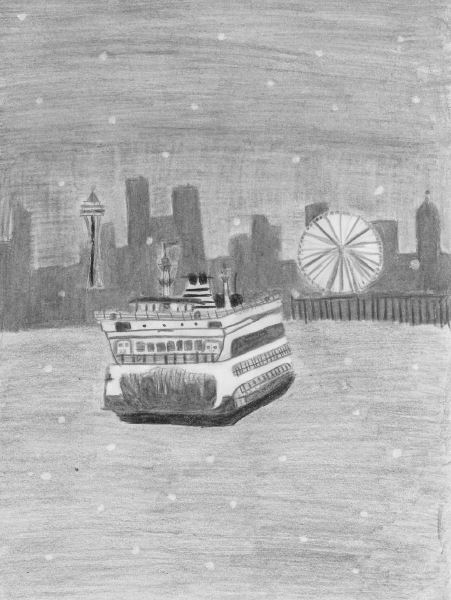 We finally picked the drawing by 10-year-old Ellie Heldridge of Seattle showing off a ferry and the Seattle skyline. Ellie’s drawing will be featured on the cover of the 2017 winter sailing schedule. of our contest and will be featured on the cover of our 2017 winter sailing schedule. It’s that time of year when kids flock back to classrooms across our state. Did you know that our ferry system plays a big role for many school kids? It’s true! Every year we carry thousands of students to and from school and on field trips, and we know among those kids many are great artists. This year, we want those future Van Goghs, da Vincis and Groenings to help us out. We print new ferry schedules every season and distribute them across the 10 ferry terminals and 22 vessels that make up the largest ferry system in the United States. This is where those artistic kids come in. All K-5 graders are invited to enter a drawing that captures what they think “Winter on the water” looks like. We invite the state’s young artists to join our drawing contest! 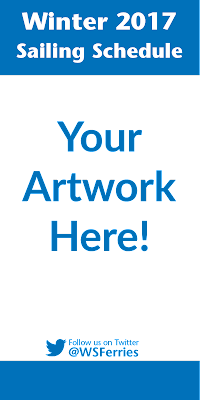 We need a great drawing to put on the cover of our 2017 winter sailing schedule that best captures the theme of “Winter on the water.” If your drawing is picked, you’ll see it on the cover of our winter schedule in print and online! How awesome would that be? All K-5 students are eligible and invited to participate in this contest. Submissions will be accepted through Friday, Oct. 14. Electronic: Submissions must be 300 dpi or higher, and portrait oriented. Media: Submissions must be hand-drawn (no electronic illustrations, please). Submissions may be in color or black and white but will be reproduced in black and white for the final product. 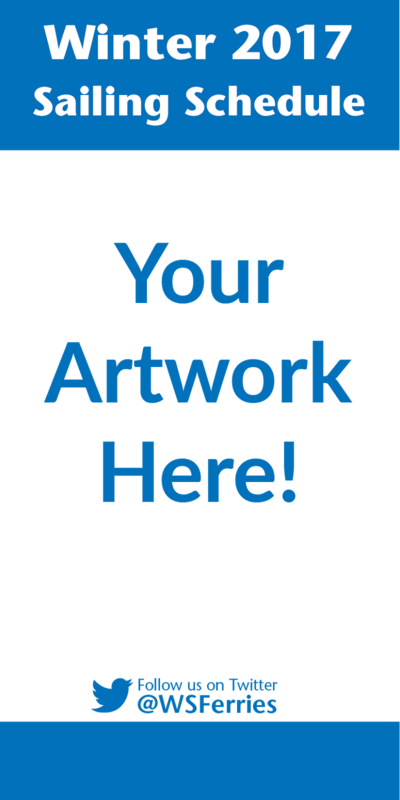 Any of the following media may be used: paint (watercolor, tempera, poster, acrylic, etc.) and drawing materials (pencil, charcoal, chalk, pastels, colored pencils, markers, crayons, etc.). Artists are encouraged to use bold, strong lines. Deadline:Submissions must be emailed to wsfcomms@wsdot.wa.gov or postmarked by Friday, Oct. 14. Electronic: Scan, attach, and email your drawing with the subject line “Winter schedule cover contest” to wsfcomms@wsdot.wa.gov by Friday, Oct. 14. In the body of the email include the student’s name, age, school, and the best phone number and email to contact them with. A panel of judges from our ferries executive team will review entries. A winner will be selected whose work best depicts the theme of “Winter on the water.” Entries will be judged on creativity, originality, clarity of theme and artistic merit. Five finalists will be selected and featured on our website, on our Twitter feed, and in our weekly update. From those finalists, a winning drawing will be chosen to be featured on the 2017 WSF winter sailing schedule. much-needed updating over the next month. Old bridges can be really cool, but, well, they’re also old. And in many cases, they need to be updated. Our crews in Whatcom County will be doing just that on the Coal Creek Bridge west of Kendall and another unnamed bridge east of the Maple Falls area along State Route 542/Mount Baker Highway starting Thursday, Sept. 8. Both wooden bridges were built in the early part of last century and need to be strengthened and brought up to current codes. The first phase of work will require three separate hour-long single lane closures between 7 a.m. and 4 p.m. Tuesday through Friday for a couple weeks. The second phase will begin immediately after the first phase and require a continuous single lane closure from 7 a.m. to 4 p.m. daily Tuesday through Friday. The project is expected to be complete by early October. These bridges have several inches of asphalt on top of both decks – too much for the bridges’ design by today’s standards. So there’s two ways to go about fixing that. You can take asphalt off to lighten the load on the decks, or you can beef up the bridges. We opted to go with Plan B. Removing asphalt from the bridge isn’t more cumbersome for us, but it certainly would be for drivers. We’d have to completely close both bridges for an extended period of time. However, making the bridges stronger only requires single-lane closures, which means people can make one last trek to Artist Point before it shuts down for the winter. So how do you make a bridge stronger? be brought up to modern bridge standards. Before I answer that question, here’s an abridged version (get it?) of how a bridge works. The surface that you drive on when crossing a bridge sits on a deck. It’s basically like the floor of the bridge. The deck sits on top of wooden planks, called stringers, that run lengthwise on top of the bridge supports. Still with me? Those stringers sit on top of other wooden planks, called caps, that run horizontal across the width of the bridge. The caps sit on top of the piers, which are the posts that hold up the bridge. Got it? To strengthen these bridges, we’ll raise each bridge about an inch, replace some caps, and add some stringers to make the bridge stronger. Think about it this way. You may have seen a kitchen that has had a refrigerator or oven sit in the same spot for a while, and the floor starts to sink a little. To fix that and help the floor hold that weight, you’ll go under the house and add new floor joists. This bridge maintenance work is essentially the same thing. 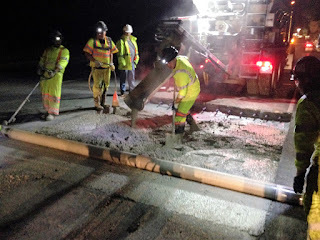 And as always with any of the work we do that requires us to reduce lanes of traffic, thank you for your patience. We’ll do the best we can to finish the work and reopen both lanes as soon as possible.